Some people believe that a little tough love is necessary in order to really show they care. Instead of giving someone whatever they want, they show that they care about them by being a bit harder on them in order to help that person improve. Others believe it is important to go easier on others and cut them some slack once in a while. 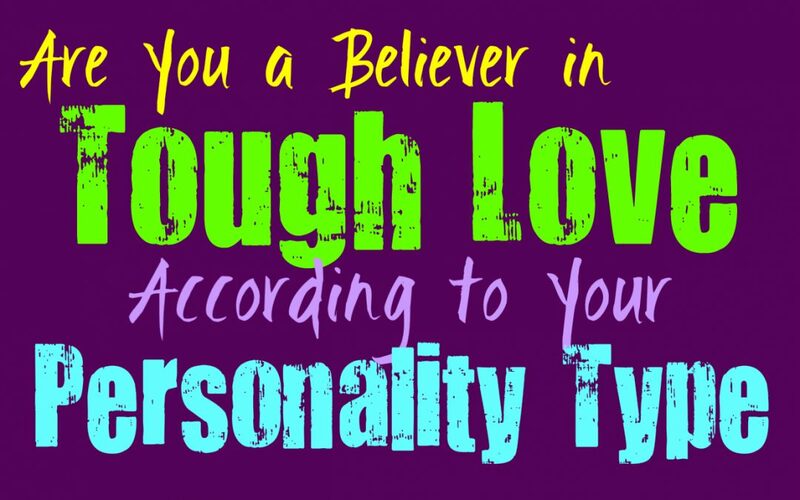 Here is how you feel about tough love, based on your personality type. INFJs aren’t often fans of tough love, and prefer to cut people some slack. They realize that life is challenging and that everyone has their own path to follow. INFJs don’t often believe in being hard on people, instead they can become frustrated with those who seek to judge. For the INFJ it is best to give people room to make mistakes, and simply show them support when they are in need. INFJs don’t like when people are unnecessarily hard on others, and use the excuse of tough love in order to make it acceptable. For them it best to give people the chance to make things right and to allow them to be a bit flawed. ENFJs aren’t usually fans of the tough love ideal, instead they believe in giving people space to make mistakes. They don’t like being hard on others and can actually be more lenient than anything else. When ENFJs care for someone they believe in being kind and gentle, not harsh and overbearing. They strive to make others happy and do their best to make their lives easier. ENFJs usually dislike people who use tough love as an excuse to be cruel and just speak without a filter. INFPs aren’t often believers in tough love and might actually find it to be a bit cruel. They believe in giving people room to make mistakes without constantly feeling someone breathing over their shoulder. For the INFP tough love can be truly crippling, and only makes them feel like that person doesn’t care for them. They prefer a sense of patience and compassion much more than someone who just want to be harsh in order to make a point. ENFPs aren’t usually believers in tough love, instead they find this to be pointless most of the time. They don’t respond well to someone trying to make a point by being harsh towards them, instead this often has the opposite result. ENFPs need to be around people who are forgiving and understanding, and have a sense of compassion. When people try to use tough love as an excuse to be harsh, the ENFP usually has very little respect for that person. INTJs actually can be believers in a bit of tough love, but for them it depends on the situation. If they care for someone they want to be completely honest with them, and sometimes they lack tact with how they express things. INTJs don’t believe in just standing idly by while their loved ones fail and ruin their lives. If they see someone is making a mistake, for them it is best to express this and not to sugar coat it with pointless fluff. When they care for people they want to help them, and so sometimes this means a bit of tough love. ENTJs can sometimes be believers in tough love, especially when it seems like the most logical approach. They aren’t great at sugar coasting things, and believe in doing everything as efficiently as possible. ENTJs also don’t find it easy to relate to or understand the emotions of others, which causes them to be a bit tactless sometimes. While they care deeply for their loved ones, sometimes their affection can come across as tough love. ENTJs want to find practical ways to help the people they care for, and so they seek out ways to fix whatever they are doing wrong. INTPs can be in the middle when it comes to their take on tough love, since they believe it shouldn’t be executed at the right times. In most situations they keep to themselves and don’t like trying to control others and their choices. When the INTP is trying to be helpful sometimes they can come off as a bit harsh, but this actually isn’t their intention most of the time. For them it isn’t about tough love, it is just about being accurate so that they can truly help someone improve their situation. ENTPs don’t usually believe in too much tough love, since it feels a bit unfair. They are perfectly accepting of mistakes, as long as people are willing to learn from them. ENTPs can seem a bit harsh in their delivery sometimes, but this is simply because they are precise people. Their intention isn’t usually to be upsetting or to deliver tough love, since they usually only believe in this in serious situations where it is entirely necessary. They are direct and honest with people, but that is because this is who they are. ISTJs do sometimes believe in a dose of tough love, but not on a constant basis. For them it is important to be direct with the people they care for, and to show them what they might be doing wrong. ISTJs value efficiency and hard work, and so they strive to show people how to improve and accomplish their goals in life. Sometimes the directness of the ISTJ can be a bit harsh, but they do often believe that tough love can be a helpful way to push people in the right direction. ESTJs do sometimes believe in tough love, especially when someone is failing a lot in their lives. ESTJs value efficiency and hard work, and so they will do their best to help others improve their lives. When the ESTJ is honest and direct with someone it can seem a bit harsh, but they are simply trying to be helpful. For them it is more important to obtain the results that matter, than to sugar coat things for the sake of someone’s emotions. ISFJs aren’t often fans of tough love and might even find this to be a bit upsetting. They have a hard time when their loved ones are in pain and they simply strive to prevent this from happening entirely. For the ISFJ tough love is just too harsh and can only result in their loved ones feeling hurt. ISFJs don’t want to hurt others, since they are so naturally sensitive to the emotions of those around them. For them it is best to take care of others and to be a little bit more sensitive when they are trying to express something difficult. ESFJs don’t usually believe in tough love, they often feel like it is a bit cruel and pointless. They strive to take care of their loved ones and provide for them, and so they don’t want to do anything that might hurt them. ESFJs are extremely sensitive to the emotions of others, and can naturally feel when something is bothering them. Because of this sense of empathy ESFJs really don’t like delivering tough love unless it is completely necessary. ISTPs aren’t often fans of tough love, but they do believe in being direct. They don’t like hovering over people and instead prefer to give them room to make their own decisions in life. For the ISTP tough love comes from a place of trying to control someone and mold them the way they desire. They would rather be honest and do their best to inform others, but then allow them to go about their lives in their own way without trying to push them in a certain direction. ESTPs are direct people and so sometimes this can appear a bit like tough love. When they care about someone they seek to be honest with them in an attempt to help that person better their lives. For ESTPs it isn’t about tough love, but more about being factual and upfront. They can be sensitive to the emotions of others when they need to, and will be capable of taking a step back if someone is clearly upset by their directness. ISFPs aren’t usually fans of tough love and might actually despise this way of approaching people. They believe in being honest but also sensitive to their loved ones. ISFPs don’t enjoy feeling like someone is pushing them or trying to control them, and will be a bit sensitive when their loved ones are harsh towards them. They think it is better to be considerate and sensitive to others, and to give them room to make their own choices in life. ESFPs believe in feeling free to make their own choices, and so they don’t often enjoy tough love. For them it is better to be sensitive to others and give them room to grow in their own ways. ESFPs believe in giving people space, even if they are making a few mistakes in life. They often become truly hurt by people who attempt to use tough love on them, and won’t really feel the love part of this at all.